I almost did not make this recipe because it was called an “oven risotto” and described as “so self-sufficient it doesn’t need your constant attention.” The concept of oven risotto irritates me because it feeds the dish’s reputation as fussy and time consuming to make, neither of which is true. When I’m tired and don’t feel like cooking, I make risotto. It’s a great way to make use of leftovers, it’s creamy and cheesy, and you can eat it with a spoon. It’s the most comforting dish there is. I want to convince you that risotto is easy and quick to make. If you have rice, chicken stock, Parmesan cheese, and 20 minutes, you can make risotto. You’ll spend the majority of those 20 minutes sipping wine (but you can also wash the dishes if need be.) You don’t need to stand by the stove the entire time. All you need to do is give the risotto a stir occasionally to make it super creamy (and to make sure it doesn’t stick to the bottom of the pan. Add cooked meat and veggies toward the end of the cooking time—or don’t, if you like it simple—and then stir in Parmesan cheese to finish the dish. You’re done. Aren’t you proud you didn’t order takeout? If you ever come across an oven risotto recipe, don’t make it. First of all, it won’t be a put-it-together-and-forget-it kind of dish, which would be the only reason it would actually be worth making risotto in the oven. The original recipe that inspired this dish, for example, required frying the onions, sautéing the rice, cooking down the wine on the stovetop, and then baking the risotto. So you saved what—three stirs on the stovetop? I wouldn’t exactly call that self-sufficient. I’ll admit that this number’s a little fussier than usual, as you do need to blitz the pesto in addition to making the risotto. But the bonus is that you’ll have some pesto left over, which you can use to top a quick pan-fried piece of fish, slather in a sandwich, or mix into some pasta tomorrow. All said, you get two (or more) meals in one. Good deal all around I’d say. A light yet satisfying meal that won't take you long in the kitchen. Add cooked meat and veggies toward the end of the cooking time—or not if you like it simple—and then stir in some Parmesan cheese to finish the dish. 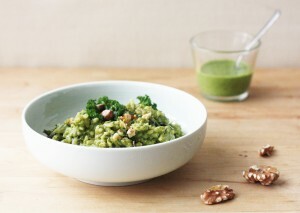 Make the pesto: Pulse the walnuts and garlic clove in a food processor until finely ground. Add parsley, chives, kale leaves, olive oil, salt and pepper, and process until smooth. If the pesto remains too stiff and chunky, add cold water, 1 tbsp (15 ml) at a time, until the pesto comes together and has a relatively smooth texture. Make the risotto: Bring the vegetable (or chicken) broth to a simmer in a small pot, then keep warm. Warm the olive oil a large, shallow pan over medium heat. Add the sauté over low heat until the onion is translucent, about 5 minutes. Add the risotto rice and stir 2 minutes. Add the white wine and simmer until the wine is absorbed. Add 1 ladleful broth; stir until the broth is almost completely absorbed. Continue adding broth, one ladleful at a time, allowing each ladle to be absorbed before adding more. Once you’ve used 2/3 of the broth, add the chopped kale. Keep on stirring and adding broth until you’ve used it all up, kale is wilted, rice is tender with a little bite, and the mixture is creamy but not stiff. Stir in about ½ cup (125 ml) of the pesto and leave on the heat for a minute or two, stirring continuously, to warm up the pesto. Taste and adjust seasoning, if needed. Divide between warm shallow bowls (risotto should always be served in warm bowls!). 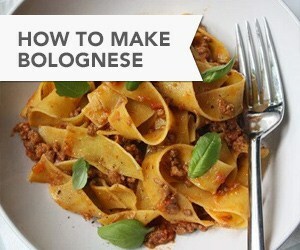 Top with toasted walnuts and serve immediately.